Directions: From the traffic light at the west end of AR62/412 in Mountain Home (bypass), travel 11.2 miles and turn right onto AR178 toward Flippin Business District. Cross the railroad tracks and continue 0.3 miles and turn left onto AR202. Continue 0.9 miles and turn left onto BlueBird Lane. Travel a short distance to the last house on the left. The studio is just past the house. Plenty of parking. “Art is nothing but the expression of our dream. The more we surrender to it, the closer we get to the inner truth of things, our dream-life, and the true life that scorns questions and does not see them.” This quote by Franz Marc, along with the beauty and artistic potential of the gourd, serves as the inspiration that guides Barbara Moore's work. She says that she has “always been a creative craftsy-artsy type of person,” but her love of using gourds to make art went undiscovered until she attended the annual Show Me Gourd Society Festival, held in Springfield, Missouri. She quickly fell in love with gourd art and has pursued it ever since. Completely by chance, Moore met nationally known gourd artist and instructor Joyce Campbell. For a year and a half, she learned from Campbell, developing her own personal style, using a plethora of mediums and techniques including wood burning, carving, cutting, clay modeling, embossing, painting, and decoupaging, paired with mediums ranging from ink, dyes, paints, gold leaf, and decoupage, to create her works of art. 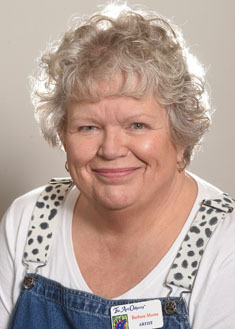 In addition to having won many awards for her work, Moore also serves as the workshop coordinator for the annual Show Me Gourd Society Festival and is a member of the American Gourd Society and Missouri Gourd Society. Moore & her husband have also started a “Gourd Patch” in Arkansas with 20 members currently. Presently, Moore makes her home near Flippin in close proximity to the White River with her husband. She also teaches classes at Interior Marketplace & Design and in her own studio in Flippin. Her artwork may be viewed and purchased at both locations.